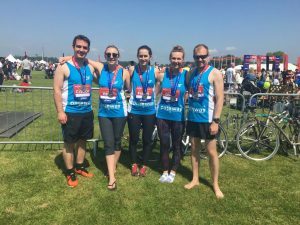 Seven really is proving ‘lucky for some’, after seven intrepid runners from health consultancy Carnall Farrar took part in the Virgin Sport Hackney Half Marathon on 20 May, to raise funds for Pathway. 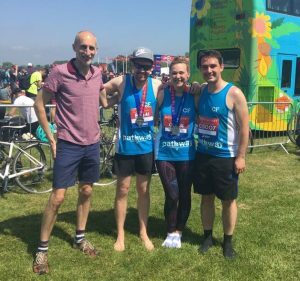 The team braved one of the hottest days of the year and took to the streets of east London, finishing the challenge and raising a whopping £765 to help seriously ill homeless people. Pictured here with Pathway CEO Alex Bax (who met them at the finish line! ), the team has raised enough to provide 50 homeless hospital patients with ‘dignity in care’ kits, including toiletries and pyjamas for their hospital admission, travel tickets to a safe bed once a Pathway team has arranged one, and a duvet and pillows to help them set up in a new home. “Being ill, alone and in hospital was one of the scariest experiences I faced when I was homeless. Knowing that someone cares really helps. This donation will make such a difference to so many people. Well done, and a huge thank-you to all of the runners and donors who took part and made this an amazing event.